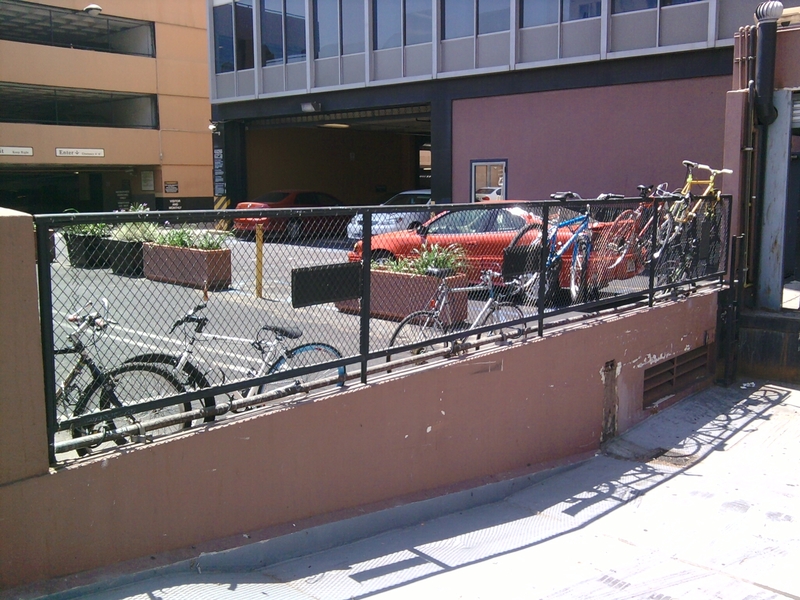 Los Angeles Eco-Village has a whole room set aside for residents’ bikes, and we’re looking at doing additional visitor bike parking out front. This post isn’t so much about eco-village’s bikes, but about the lack of accomodations for Los Angeles’ bicyclists in our public and private spaces. This, of course, is not really news. L.A. bicyclists know that our streets and our destinations rarely are designed and built with us in mind. Various other spaces in L.A., from our new police headquarters to our concert hall have huge accomodations for car parking, but little to nothing for bicycles. I found myself downtown last week, after a Green L.A. Transportation Working Group meeting with Mayor Villaraigosa’s environmental and transportation deputies. I decided to chill by watching a movie. I used to frequent the old Laemmle Theaters in the basement of the Marriott Hotel, but they closed last year, due to low attendance and competition from new theaters at L.A. Live – a new upscale mega-redevelopment ajacent to L.A.’s sports and convention centers. LAL just opened up a year or two ago, so you might think that they would be up-to-the-moment on trendy new things like bike parking. Why do L.A. schools need so much parking? Some of my earlier posts (here and here) have covered some of Los Angeles Eco-Village’s struggles with the Los Angeles Unified School District. LAUSD plans to build a large surface parking lot in the heart of our neighborhood. We think it’s not a good idea. Though we’ve heard some preliminary rumbles that there’s a compromise in the works, we’re keeping the pressure on until we see the actual plans and arrangements. I am the primary author of Getting to work: Your clean air commute – a report released last week by the non-profit Coalition for Clean Air. It’s about what large employers are doing and can do to promote alternative transportation. One of the surprises that I learned in researching the report is that Southern California’s South Coast Air Quality Management District (SCAQMD) rideshare rules don’t apply to school districts. Not even looking at student trips, the LAUSD generates a lot of car trips; it’s the second largest employer in Los Angeles County. LAUSD promotes using a car for these trips by providing lots and lots (pun intended) of “free” parking. So one of CCA’s recommendations is that SCAQMD reconsider their current exemptions for school districts. Two local school districts rank among the top 30 largest employers in the county, and with 75,000+ employees, Los Angeles Unified School District (LAUSD) ranks as the second largest. School districts are exempt from SCAQMD rideshare requirements. No district rideshare programs exist, other than a tiny program at LAUSD headquarters. In addition to negative environmental impacts, lack of clean air commute incentives impacts the siting and design of schools. Without incentives for alternatives, school districts are more likely to site new schools farther from public transportation and build larger parking lots. Employees are then more likely to drive and park, leading to increased space requirements and costs for parking. This takes away space and funding for students and complicates the search for new school sites. More than just large employers, schools are where the behavior of future generations is shaped. School teachers and staff can inspire the next generation of clean air commuters. Whether legally mandated or not, school districts should implement clean air commute programs for teachers, staff and students. It may be easiest to pilot these programs at administrative offices, yard facilities and older schools in the most densely urban neighborhoods, where parking is often insufficient and transit alternatives are most viable. School districts should collaborate with cities to pursue state Safe Routes to School funding, which can improve biking and walking for staff and students. SCAQMD loopholes exempting school districts should be reconsidered. New mandates should be employed judiciously and possibly phased in over time. Parents, PTAs and students should work with their local schools to encourage programs and facilities that make transportation to school cleaner and safer. There are many programs for encouraging student clean air commuting which can dovetail well with similar programs for employees. To read the full report, and to add your comments and questions, go here. New Design for LAUSD Parking – with Garden! Check out the new design above, done by architect Ian MacIlvaine of Tierra Sol y Mar, who sits on the board of the Cooperative Resources and Services Project (CRSP) which is the parent non-profit that started Los Angeles Eco-Village. It shows the existing vacant lot at the northeast corner of Bimini Place and White House Place preserved and transformed into a keyhole garden. Below is the design that the school district is proposing. There are 135 spaces and the project is going out to bid for $1-3 million… so that’s $7,400 to $22,200 per parking space. Providing free parking is a pretty topsy-turvy world, where the average parking space does cost more than the average car. For really great work on the myriad issues related to parking, see the work of Don Shoup. Both of these designs have 134-135 parking spaces… which, in my opinion is still excessive for a school in the thick of a dense urban neighborhood… located two blocks from a subway station and adjacent to some of Metro’s most frequent bus lines. We eco-village residents are pushing to preserve the corner area, for a garden, and to change the design of the parking lot, so that cars exit only onto First Street, and not directly into our neighborhood streets. We’d, of course, prefer something other than a parking lot at that site (perhaps mixed-use housing), but at this point, we’re somewhat resigned that theere will be parking there, and we’re working to trim its worst excesses. See this earlier post for more background on this latest round of Los Angeles Eco-Village negotations with the Los Angeles Unified School District. That post includes a letter you can write in support of preserving the corner lot as a garden.